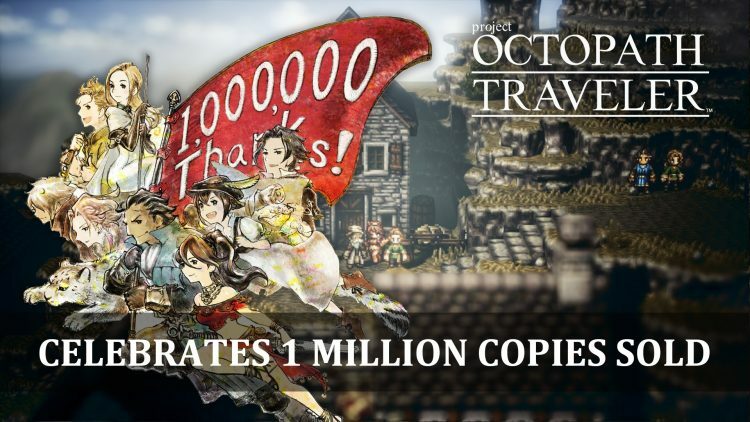 It was last month when Square Enix released the Nintendo Switch exclusive JRPG Octopath Traveler. Combining a mix of retro nostalgia with modern elements, Square Enix have seemed to have achieved a winning combination as they achieve 1 million copies in sales and shipments. Nintendo have made an announcement through their official Twitter account celebrating the 1 million copies sold achievement which includes digital downloads from the Nintendo eShop. Square Enix produced a game exclusively for Nintendo Switch which shows the support that the platform is gaining. Even with more titles getting ported to Nintendo Switch, it was interesting to see a game released exclusively on the platform which was in a retro style, but focused on more modern elements which can be enjoyed both in handheld mode and docked mode. The game also received two demo versions before it’s launch, allowing players to give feedback to help shape the game further. Octopath Traveler is available on Nintendo Switch, you can also test out the prologue demo which let’s you try out eight different characters. If you want to know more about Octopath Traveler you can check out our Octopath Traveler Preview – A Retro Turn-Based RPG With A Modern Twist. You can also catch up on some of the latest Nintendo news in Nintendo’s Gamescom 2018 Lineup Revealed, Nintendo Switch Subscription Is Now Available For Pre-Purchase and Salt And Sanctuary Releases On Nintendo Switch On August 2nd 2018.